Q) Can I put shutters on a sliding glass door? Q) Can I put shutters on a French door? Q) Can I put wood shutters in the bathroom. 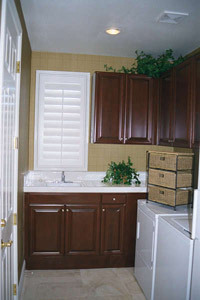 A) It is very common to put shutters in the bathroom. Q) Can shutters parts be replaced or repaired? Q) What colors do they come in? A) We have... See our finished web page. Q) Should I use wood or synthetic?